I like Dee looking in (to find Brad, no doubt). I tried very hard to have almost no product placement in Little Dee, but I felt okay about this one. I did do the research, both the stats about penguins and which minivans out there (at the time) were most friendly ot the environment. This strip just makes me grin every time I see it. Yes, Vachel, you DO deserve a milkshake. 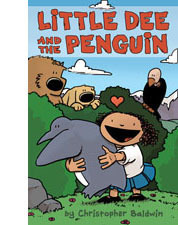 I did some research on this one, both about penguins and also about Pittsburgh (Mario Lemieux is a well known hockey player there). A fun strip to write.